With Halloween being only a few shorts weeks away, we decided that a Hop to help you get ready was in order! This event will run from October 1 through October 15, that gives you enough time to hop on down the list and enter all the SPOOKtacular Giveaways for your GHOULS and GOBLINS! Each blogger is giving away prizes valued $15 or more. Everyone knows the story of Noah's Ark, right? It's probably one of the most popular Bible stories there is! There are movies and books galore and even bedroom decor for kids. If you know only one Bible story, chances are that one story is Noah's Ark. 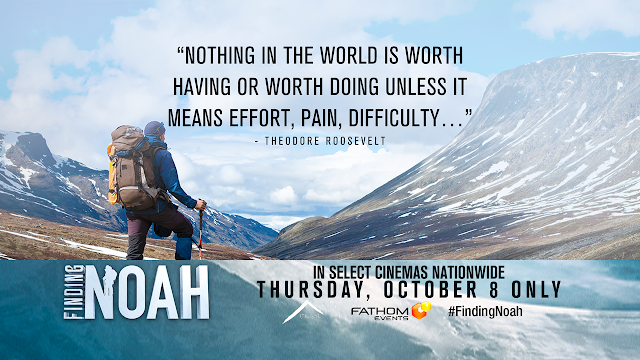 Join director/producer Brent Baum and the FINDING NOAH film crew as they follow an expedition of intrepid explorers on a perilous trek up to Mt. Ararat's desolate summit. There, using state of the art technology and real-time satellite imagery, this team of archaeologists, scientists and professional mountaineers will begin a grid work of exploration unlike any before, hoping to finally resolve the age-old question: did Noah and his Ark actually exist? Now, I must admit, I'm not a huge documentary person, but when I find a topic that interests me, I do enjoy them on occasion. This is a topic that definitely caught my attention, so I was thrilled to have the chance to screen in advance of the theater release October 8. If you're expecting a fast paced adventure documentary, you might find yourself a bit disappointed. Don't get me wrong, there is plenty of adventure, but nothing crazy! The first part talks about the history of the searches for Noah's Ark, including stories of sightings and theories- it might sound a little boring, but it was actually pretty interesting to hear. I may have known the story of Noah's Ark, but I didn't know about all of this history. Then came the actually journey itself. It was fascinating to see just what went into this journey. It wasn't an easy road, and there were disappointments along the way, but these men held onto their faith throughout the expedition. And this wasn't just a movie about faith...they used science and history to truly search for the ark in a way that even non-believers could say was legit. So, did they find anything? You'll have to watch for yourself to find out...but one thing is for certain, sometimes it doesn't matter what you do or don't find- the real experience is all about the journey. Grab this Grand Trunk ultralight travel hammock if you love camping or hiking. This hammock weighs less than a pound when packed up and takes up no more room than a standard sleeping bag, making it easy to carry with you. Quick setup and tear down time makes this product a practical luxury to bring with you on your next trip. With the ability to support up to 250 pounds, this hammock can be a comfortable place for almost any member of the family. Hammocks are so popular again, my college son wants one badly for campus, the kids hang between trees and relax and do homework in them. Thanks for sharing. I would love to have this travel hammock. My daughter has one and loves it. She puts it up at college and study's. I have always wanted a hammock. This would be great for camping. I would LOVE hammock! Would be perfect for relaxing. A hammock is just the thing to get me missing summer again. I want to see this movie. I think there should be more movies that have meaning like this one. This sounds so awesome!! I admittedly love documentaries!! I will have to make sure I watch this one right away!! I bet its so fabulous!! The hammock sounds so great for camping!! I'd love to use this, I'd use it here at home since we don't travel. I would be very interested in watch the documentary-- I totally believe in the ark but would be interested to see if they found anything! Thanks so much for the awesome giveaway! I have the perfect spot picked out in my backyard for a hammock! Just the hammock. Thanks for a chance to win. Very interesting giveaway item that I know my husband would enjoy. I am anxious to see the Finding Noah movie. And I would love to try the hammock. Thak You. I really want to see this movie. I love exportation movies it is right even if they do not find what they are looking for it is the journey that is exciting. I would love to see this documentary. It looks like they really went out and searched for the proof even in rough conditions. I would be so thrilled to try out this hammock. Me and my hubby are survivalists! I'd love to surprise him with this ultra light hammock! We don't have one yet! This would be great to take camping, I love hammocks. This would be great when we go camping! They got me a maker well disposed contract and got me paid on time each quarter. I'm happy I procured them. The second installment of Fantastic Beasts, titled Fantastic Beasts: The Crimes of Grindelwald picks up shortly after the first where Grindelwald (Johnny Depp) has been captured and is being taken transferred back to the British Ministry of Magic when he manages to escape and take over the carriage in which he is being transported. As the opening scene, this sets the visual standards for the film extremely high. As they are hurdling in the sky on a carriage in a thunderstorm, the tension and excitement build setting the stage for a fantastic film. There are availability alternatives to watch movies you need from a database. watch series Most film records are gathered into classifications and all the more frequently in order masterminded.